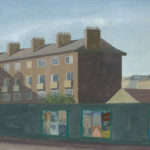 Eithne Jordan is one of the most respected painters of her generation. Over the past three decades her work has arched from a savage new expressionism to a quiet and considered representation, from the angst of the figure to the existentialism of the street. This recent series follows her interrogation of the urban that had been mainly focussed on European cities but now turns its attention to Dublin. And though there are recognisable scenes in this work there is nothing familiar or reassuring in the method of their capture. The light is one of early dawn and pending darkness. The geometry of architecture, the furniture of the contemporary street, the directional signage and advertising’s visual noise are softly focused so as to keep their general characteristics but avoid their specific particularity. Jordan’s painting is held in a modulated tonality. Jordan’s streets are empty of occupants save for the odd passing car yet this absence of figure seems to push the nature of narrative to the foreground of our response to them. Many of these scenes contain domiciles but we are excluded from the domestic confined to ever present questions as to why we are so irrevocably outside. Eithne Jordan RHA Rotterdam Night I 2007 oil on linen 50x65cm. Image courtesy of the Rubicon Gallery. Eithne Jordan RHA Hoarding II 2012, casein and gouache on paper 18x24cm. Image courtesy of the Rubicon Gallery. Eithne Jordan was born in Dublin and lives and works in Dublin and the South of France. She studied in the Dun Laoghaire Institute of Art, Design and Technology and then at the Hochschule der Künste in Berlin. Solo exhibitions have included, Small Worlds at the Mac, Belfast and the RHA, Dublin, Street Stills, Assab One, Milan, Night in the City, Rubicon Gallery, Centre Culturel Irlandais, Paris, Fenderesky Gallery, Belfast, The DOCK, Carrick-on-Shannon and Galway Arts Centre, Galway.